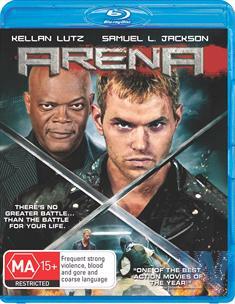 Kellan Lutz (Twilight series) and Samuel L. Jackson are the main stars to grace Arena, an action thriller by director Jonah Loop. Although a clichéd and rather over the top story, there was something actually quite entertaining about Arena which is basically a modern incarnation of the gladiatorial fighting but is illegally broadcast on the net. I think it was this corny premise that made so fun to watch. The villain behind this modern day fight club is Logan (Jackson) a wealthy businessman who runs these sadistic fights and the best way to get opponents is to kidnap then. This is where David Lord (Lutz) comes into the picture, a fireman who has been taken by Logan and in order for him to be set free, he needs to fight for his freedom and more importantly win. However when Lord discovers a secret about the Arena, turmoil sets in and the action definitely ramps up in classic Hollywood action movie. Also joining Lutz and Jackson is the talented Daniel Dae Kim (Lost) and Nina Dobrev (Vampire Diaries) who was definitely hired for her looks but she actually fits perfectly in with this ridiculous plot. However the star of Arena is once again Mr. Jackson himself who plays the perfect super villain and would not look out of place in a Batman or X-Men film as he has evil rushing through his veins. Even his acting is quite clichéd as the villain. Also, if the story sounds a little familiar, that's because it was written by Tony Giglio of Death Race 2 and 3 fame, so if you enjoyed both these over the top straight to DVD/Blu-ray films than Arena is right up your alley.